We recently acquired a Liberia 50 Dollar 2001 coin. These are large 10 cm diameter coins, made in silver and only 500 were minted. There current book value is $1100. 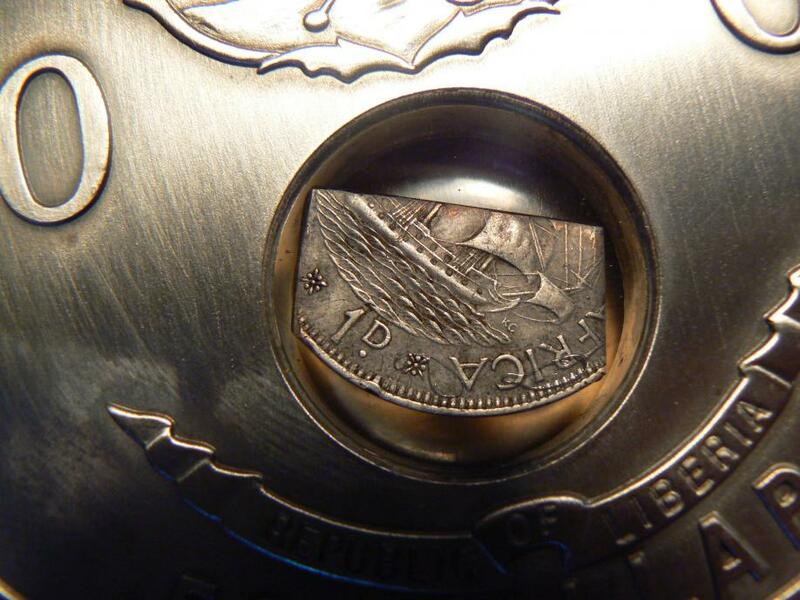 A 10 Dollar coin was also made in copper (also 10 cm diameter), with a book value of about $200. The 10 Dollar coin is supposed to weigh 770g, and the 50 Dollar coin 907 grams. 1. No box or certificate of authenticity. 2. It weights 780 grams, rather than 907 grams. 3. The coin fragment embedded is supposed to be from the wreck of the ship Princess Louisa, which sank in 1743. Our coin fragment is from a South African penny 1936 to 1952. 4. There are small black burn marks on the underside of the glass window, on both sides. I had our coin tested using an x-ray analyser, and it's copper-nickel. We have seen 7 of these coins in Cape Town in the last 6 months. You can find them on Gumtree, and at least 2 have sold on Bid or Buy since December 2013. One is currently for sale on Bid or Buy. I am in no way implying that either the ones sold on BoB or the one currently for sale are fakes - I have not seen them or tested them, so I cannot judge them. However, given that at least one coin has been confirmed as a fake, I would suggest buyers beware and sellers go out of their way to confirm authenticity. I wouldn't recommend that anyone buy these coins at all, real or not. That is, unless they do not care about getting their money back. You mention that the book value is $1100. By this, I presume the catalog value in Krause. The two sales on BoB are much cheaper but hardly ones that seem compelling given that the actual collector base for Liberia coins except for a few from the 19th century must be virtually non-existent. If this is correct as I am virtually certain that it is, the "low" mintage of 500 is hardly low at all. I mean, is there any reason to think the demand for this coin should be more than the 1950 Union proof set with the same mintage but a likely somewhat lower survival rate? At least the Union set is a real collector item. Modern Liberia coins like this one are better described as artifiically created collectibles (like those issued by the Franklin Mint in the 1970's) though this one differs from others I have seen. I wasn't aware of the wieght. So even at R7100, its a reasonable price for those who want a bullion substitute. But at that size, I still do not consider it a real coin. And yes, you are correct. I was referring to the copying of prior US coin designs in Liberia coinage. The one that specifically comes to mind is a 2000 dated gold coin (I believe $250 FV) imitating US pattern J-1776, the unique1907 $20. The mintage of this "coin" is 250 I have no interest in it now but I would have bought it at the time IF I could have done so for a slight premium to bullion value. I believe the actual price at the time was in the vicinity of 3X when gold prices were about $500. It must have been a stark naked lunatic who faked the coin and then put a partifact of a SA Union George VI Penny in the capsule. To reproduce (fake) that coin must have cost a fortune - where did he/she get the press machinery to strike it? Who did he think would buy it after all the trouble he went through - with it being an obvious fake and all that ? 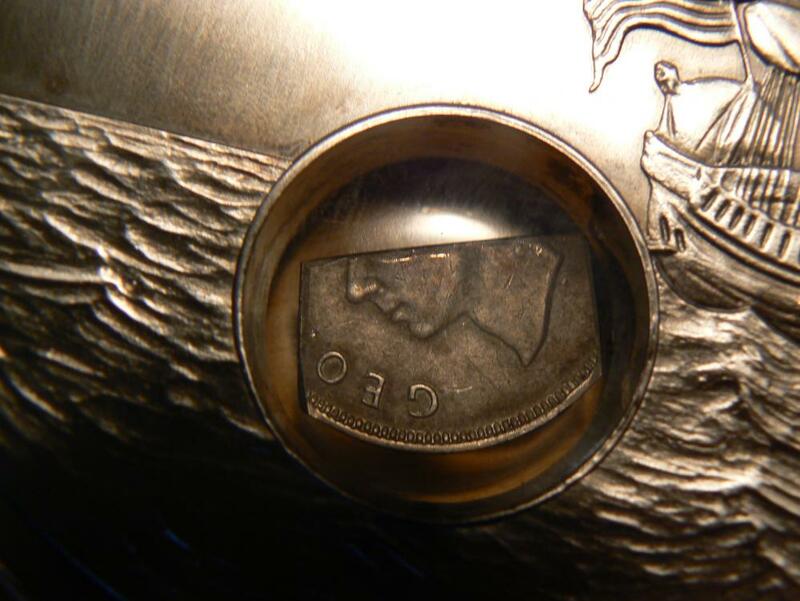 Do you have a close up picture of the Union Penny inside it? Herewith the pics of the Union Penny. I am lost for words - why on earth would anyone go through a ton of trouble for this? Maybe we have a local Numismatic Sherlock Homes who could investigate this strange whateverness for us?